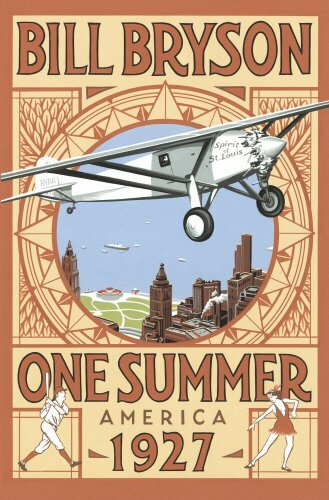 In One Summer Bill Bryson, one of our greatest and most beloved nonfiction writers, transports readers on a journey back to one amazing season in American life. The summer of 1927 began with one of the signature events of the twentieth century: on May 21, 1927, Charles Lindbergh became the first man to cross the Atlantic by plane nonstop, and when he landed in Le Bourget airfield near Paris, he ignited an explosion of worldwide rapture and instantly became the most famous person on the planet. Meanwhile, the titanically talented Babe Ruth was beginning his assault on the home run record, which would culminate on September 30 with his sixtieth blast, one of the most resonant and durable records in sports history. In between those dates a Queens housewife named Ruth Snyder and her corset-salesman lover garroted her husband, leading to a murder trial that became a huge tabloid sensation. Alvin "Shipwreck" Kelly sat atop a flagpole in Newark, New Jersey, for twelve days--a new record. The American South was clobbered by unprecedented rain and by flooding of the Mississippi basin, a great human disaster, the relief efforts for which were guided by the uncannily able and insufferably pompous Herbert Hoover. Calvin Coolidge interrupted an already leisurely presidency for an even more relaxing three-month vacation in the Black Hills of South Dakota. The gangster Al Capone tightened his grip on the illegal booze business through a gaudy and murderous reign of terror and municipal corruption. The first true "talking picture," Al Jolson's The Jazz Singer, was filmed and forever changed the motion picture industry. The four most powerful central bankers on earth met in secret session on a Long Island estate and made a fateful decision that virtually guaranteed a future crash and depression. "Bryson writes in a style as effervescent as the time itself... A wonderful romp." ..".A skillful lesson on the dynamics and personalities that shaped today's America and on how far the country has evolved from a gaudy era fondly but imperfectly recalled." "There are two kinds of readers: those who love Bill Bryson and those who haven't met him yet... Colorful, rollicking and sweet, this is Bryson being Bryson. Which is to say: marvelous." 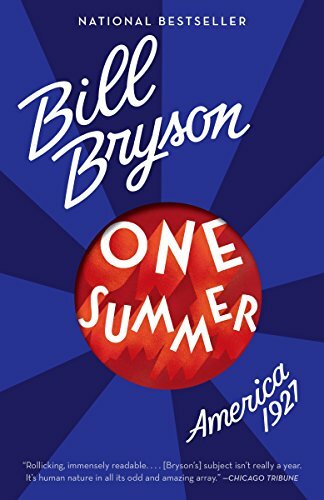 "A glorious look at one summer in America...Bryson offers delicious detail and breathtaking suspense about events whose outcomes are already known." "This splendid book, written in the breezy and humorous style that has come to be Bryson's trademark, is sure to delight readers steeped in the history of the period as well as those looking to acquaint themselves with it for the first time." 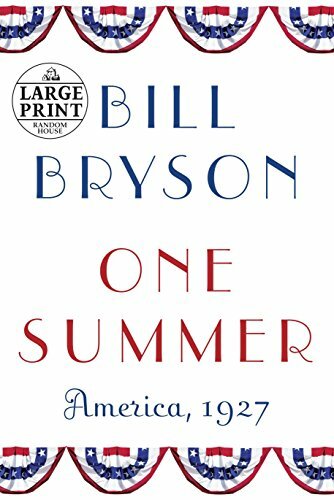 "Bryson will set you right in this canter through one summer of one year that--once you've turned the final page--will seem more critical to American history than you might have reckoned before... [He] is a master of the sidelong, a man who can turn obscurity into hilarity with seemingly effortless charm--and One Summer is an entertaining addition to a body of work that is at its best when it celebrates the unexpected and the obscure... This is a jolly jalopy ride of a book; Bryson runs down the byways of American history and finds diversion in every roadside stop." ..".Bryson himself is captivated by the events of summer, 1927. And why not? They included Charles Lindbergh's solo flight over the Atlantic, Sacco and Vanzetti's execution, Gutzon Borglum's start on the sculpting of Mt. Rushmore, the Dempsey-Carpentier fight, and Babe Ruth's 60 home runs--all of which Bryson covers in characteristically sparkling prose." "As a historian, Bryson is the antithesis of stuffy. He's a storyteller, pure and simple, and One Summer is a collection of a great many tales about people and events, centered on (but not limited to) a single season in a single year... Bryson could have written a book just as interesting about the summer of 1949 or 1913. That's because his subject isn't really a year. It's human nature in all its odd and amazing array." "The book's strength is in showing the overlap of significant events and the interaction of personalities." 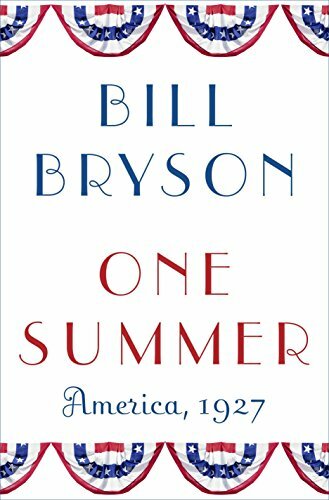 "What comes across clearest in Bryson's lucid, lighthearted narrative is the pure energy and crazed optimism of the era. Sure, the rollicking party would end, but it was fun while it lasted--as is Bryson's One Summer." ..".One Summer wins you over by the sheer weigh tof its encyclopedic enthusiasms." "Bryson is a marvelous historian, not only exhaustively accurate, but highly entertaining. If you avoid textbook histories because they seem too dry, pick up One Summer, or any other of Mr. Bryson's books. They are intelligent delights." 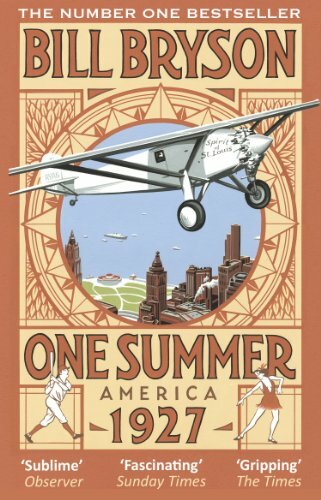 "Highly recommend One Summer: America, 1927 by Bill Bryson--interesting, entertaining visit to an incredible year." Let Bill Bryson take you back to a forgotten summer when America came of age and changed the world for ever – and show you why he is our favourite writer of narrative non-fiction.